One thing I've been pleased to discover as I've worked these past several weeks on incorporating healthier foods into my diet is how satisfying and delicious the simplest meals can be, once you've given your body a break from the junk food and allowed it to acclimate to a more whole-foods regimen. Lunch today was so simple, yet so yummy - brown rice, black beans, mixed steamed fresh greens, and half of a baked sweet potato - each component cooked simply and with no seasonings (except for a bit of sea salt in the beans). Awesome! 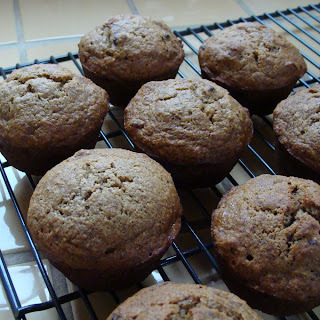 Also on today's cooking agenda: re-working an old favorite muffin recipe to bring it into alignment with my new no-refined-sugars or -flour lifestyle... this recipe is a healthed-up version the banana chocolate chip muffins in The Joy of Vegan Baking, which is itself a spin on a banana cake recipe from The Peaceful Palate, written by my friend Jennifer Raymond. * In the past I've always used dried cranberries, which taste great; however, they are usually sweetened with regular sugar, so in the future, I'm planning to experiment with other types of dried fruits that are unsweetened. Preheat the oven to 350 degrees. Spray a muffin tin with non-stick spray. In a large bowl, mash the bananas, then mix in the maple syrup, applesauce and/or oil, and vanilla. Stir in the flour, flax seeds, baking soda, and salt and mix well. Next add the chocolate chips and dried fruit and stir to incorporate. Scoop into muffin tins, filling each one 3/4 full. Bake for 25-30 minutes in preheated oven, or until a toothpick or butter knife inserted into the center comes out clean.